On a summer evening in 1977, a murder shocked San Francisco. Four men had chased two others, spotted "together." One target escaped but the other was cornered, corralled, stabbed repeatedly. The murderer screamed the timeless slur aimed at gay men. Five days later, a quarter million people marched down Market Street in the Gay Freedom Day Parade. Reaching City Hall, they saw a broad-shouldered man in a T-shirt waiting to speak. He had lost three elections, two for city board of supervisors, most recently for state assembly. During the last, his opponent told him, "you really gotta change your rap; it's a downer." Now he was running again. Stepping to the microphone, he said, "My name is Harvey Milk and I'm here to recruit you." Before he became the first openly gay man to be elected to anything in America, Harvey Milk was a conservative Republican. Navy veteran. Wall Street broker. A closeted gay who told friends, "I can't let it out -- it would kill my parents." Then, caught up in the 1960s, he moved to San Francisco. Within a year, he stunned a friend by saying, "I would love to be mayor." He had no political experience. Raised in Depression and wartime, he had pursued the common gay lifestyle -- lonely "cruising," an occasional brush with cops, shame. In San Francisco, however, Milk changed. "He was just always helping people," a friend remembered, "like getting a stop sign put in on the corner of a dangerous intersection, that kind of thing." Milk ran for supervisor in 1973 but voters considered him some "crazy hippie bad boy.” He finished tenth. He cut his hair, ran again, lost, shaved his mustache. "I want no distractions," he said. "Fifty people may not like mustaches and I'm not gonna lose by fifty votes." He ran for state assembly in 1976. Lost. And then. . .
"I'm here to recruit you. I want to recruit you for the fight to preserve your democracy from the John Briggs and the Anita Bryants who are trying constitutionalize bigotry. Gay brothers and sisters, what are you going to do about it? You must come out!" Milk had learned a vital truth. Only by being who they were, by letting the world know how many they were could gays and lesbians break down stereotypes, stand up to violence, earn respect. That afternoon at City Hall, he stood alone before the crowd. "I'll never forget the looks on the faces of those who have lost hope, whether it be young gays, or seniors, or blacks looking for that almost-impossible-to-find job. . . No, it's not my election that I want, it's yours. It will mean that a green light is lit that says to all who feel lost and disenfranchised that you can now go forward. It means hope." Weeks later, San Francisco voters upgraded their democracy by approving district-wide voting. Instead of winning the entire city, Milk only needed to win his district. And since The Castro had become a gay Mecca, in November 1977, after another campaign of struggle and joy, he won. You may know the rest. How he campaigned against an anti-gay measure in California, sending it to defeat. How that defeat (and perhaps a diet of "junk food") unhinged a fellow supervisor who had sworn to save San Francisco from "social deviates." 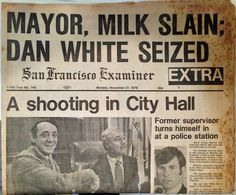 How Dan White entered City Hall, gunned down the mayor, then headed for the office of Harvey Milk. . .
Death threats had become common. "I can't take it seriously," he said of one. "It was written with a Crayola crayon." But he often spoke of an early death. "If a bullet should enter my brain, let that bullet destroy every closet door." Two bullets entered his brain. That night, the candlelight memorial stretched from The Castro to City Hall and beyond. "And the young gay people in the Altoona, Pennsylvanias, and the Richmond, Minnesotas who are coming out. . . The only thing they have to look forward to is hope. And you have to give them hope. Hope for a better world, hope for a better tomorrow, hope for a better place to come if the pressures at home are too great. Hope that all will be all right." Harvey Milk's friend, Cleve Jones, went on to design the era's most heart-wrenching symbol -- the AIDS quilt. Others who worked on Milk's campaign have had long careers in state and local politics. In 2016, the US Navy christened a new ship the USNS Harvey Milk. And every May 22, Milk's birthday, California observes Harvey Milk Day, in the name of hope.